Coming up on their 40th anniversary, the band WAR is releasing their first new album in fourteen years. Actually not just an album, but a double-CD, DVD and Blu-ray recording of a live performance at The Grove in Anaheim, CA in December of 2007. I knew of several of the band's hits: "Spill the Wine," "Why Can't We Be Friends?," "The Cisco Kid" and of course, the ubiquitous "Lowrider" which comedian George Lopez used as a theme song on his sitcom calling it the "Chicano National Anthem." 2. They're one of the first and most successful crossover bands fusing rock, funk, jazz, Latin music, R&B and reggae. 3. They boast a multi-ethnic line-up in addition to their fusion of musical styles. 4. International history was made when “Why Can’t We Be Friends?” was played in space, as NASA beamed the track to Soviet cosmonauts and U.S. astronauts in 1975. 5. WAR was the last band to jam with Jimi Hendrix before he died. 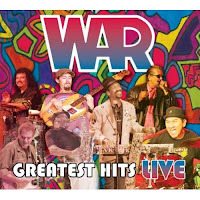 WAR Greatest Hits Live is available for order at Amazon.com.